When things go sour, an NFL team’s fan base often points to two people: the guy calling plays on the sideline, and the man behind center trying to execute them. Vance Joseph and Case Keenum in Denver? Possibly. John Harbaugh and Joe Flacco? Could be. Then again, each of those coaches could keep their jobs and have new QBs in 2019. And we know Jon Gruden isn’t going anywhere in Oakland, though Derek Carr might head elsewhere. Nor is Pat Shurmur, despite a discouraging first year in the Jersey Meadowlands, likely to leave the Big Apple. 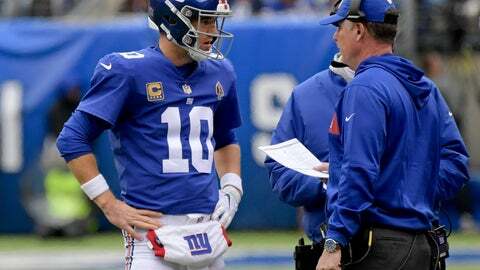 But the status of a 37-year-old Eli Manning is in more doubt. It would be a surprise to see Adam Gase out in Miami. Considering how much he has been out of the lineup in his seven-year career, it would not be a stunner to see Ryan Tannehill depart the Dolphins. Manning is not a washed-up has-been. His arm remains strong, his knowledge of the game is irreplaceable and he has three enviable options in Odell Beckham Jr., Saquon Barkley and Evan Engram. What he doesn’t have is anyone who can block with any regularity. Manning is about as mobile as Shurmur, maybe less so, and when he doesn’t get the necessary time to set himself, he’s not likely to find a comfortable place to throw. Yes, it’s time for the Giants to look for a replacement, but not necessarily someone to take over next year. How about finally improving perhaps the worst offensive line in the league and seeing what Manning can do behind it? Otherwise, Carr could wind up an option as Gruden keeps wheeling and dealing. Keenum has another year to go on the deal he parlayed his best career season (in Minnesota) to get with QB-desperate Denver. Cutting him will cost a $10 million cap hit, so unless John Elway can work a trade for that prohibitive contract, Keenum figures to be back with the Broncos. The cupboard is bare behind him, especially after Chad Kelly got himself arrested and then released. Plus, Keenum once again has had to learn a new offense, and he’s had some knee issues. Elway could be enticed to add a veteran who has won a Super Bowl, as he did with Peyton Manning (did someone say Flacco? ), but only if he can deal Keenum. Flacco, who’s had a better (but not great) season than in recent years, is bothered by a hip injury. And his eventual replacement, Lamar Jackson, was chosen in the first round of April’s draft. The massive contract Flacco earned after winning the 2012 championship as Super Bowl MVP was extended in 2016 and he is signed through 2021. But the Ravens can open up $10.5 million in salary cap space by releasing Flacco, 33, after the season, with a potential savings of $18.5 million if they designate him as cut after June 1, which would damage his value elsewhere. He won’t command the same kind of money on the open market, but he will command attention for his strong arm, solid leadership, willingness to play hurt, and, well, a pedigree that rarely reaches free agency with a few good years left. Gase in Miami certainly would like a QB who can get on the field regularly. Brock Osweiler is the 19th starter since Dan Marino ended his Hall of Fame career. None has been a star, though Chad Pennington could have been had his shoulder not been so brittle. Gase would seem to be tied to Tannehill, who has played in five games this year, none last season, because of injuries. When healthy, Tannehill helped get the Dolphins to the playoffs as a wild card in 2016, Gase’s first year in Miami. Then he was hurt for the postseason. Gase has been something of a QB guru in other stops, so a young guy who can stay in the lineup might be appealing. Or maybe a 20-something needing a change of scenery such as Jameis Winston or Bortles. Perhaps the most puzzling case of all because Winston, the top pick in the 2015 draft, should be a slam dunk as the future. He isn’t. Winston is due $20.9 million next season, the final year of his rookie deal. That’s way more than he is worth, and though the Bucs picked up his fifth-year option, they could release him in ’19 and not owe him anything; 2019 is guaranteed only in case of injury, which is why some speculate Winston may not play again this year. He comes with lots of talent, but still lacks maturity. He has had off-field issues and was suspended for the first three games this season. Do the Bucs want to start over at the position, knowing Winston’s potential remains sky high? Convinced after coming oh-so-close to making the Super Bowl that Bortles could be their franchise guy, the Jaguars signed him to a three-year, $54 million contract that includes a $16 million salary in 2019. So there would be $16.5 million in dead money if he is cut. And, like Keenum, the numbers for a trade likely are prohibitive. But folks in Jacksonville believe, despite the current 3-6 mark, that the Jags are built to win soon. Maybe not with the struggling Bortles, however. This history team boss Tom Coughlin has with Manning adds some intrigue, but a move for a veteran to replace Bortles might target someone younger and more mobile. Gruden has publicly backed Carr, but it’s difficult to gauge if that support is strong or even real. Given his maneuvers to redo the Raiders, it appears with Gruden no one is safe. Gruden would love to find a Rich Gannon clone, maybe a Flacco or even a Nick Foles. And cutting Carr would create only $7.5 million in dead money, hardly prohibitive. Then again, Gruden has three first-round selections in the 2019 draft. Using one on a quarterback makes a lot of sense.